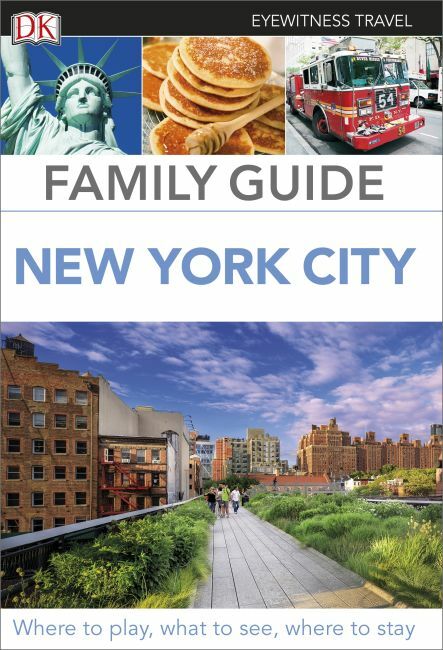 A family-focused guidebook to New York City for traveling with children ages 4 to 12. DK Eyewitness Travel: Family Guide New York City gives parents with children ages 4 to 12 the specific, family-friendly information they need to plan a vacation to a city with an abundance of history, outstanding museums, unrivaled theater, and beautiful parks. Go treasure hunting at the Metropolitan Museum of Art, ice-skating in Central Park, and explore can't-miss sights such as the Empire State Building and the Statue of Liberty. + Each major sight is treated as a "hub" destination, around which to plan a day. Plus, DK's custom illustrations and reconstructions of city sights give real cultural insight. + "Let off steam" suggestions and eating options around each attraction enable the entire family to recharge. + Maps outline the nearest parks, playgrounds, and public restrooms. + "Take shelter" sections suggest indoor activities for rainy days. + Dedicated "Kids' Corner" features include cartoons, quizzes, puzzles, games, and riddles to inform and entertain young travelers. + Listings provide family-friendly hotels and dining options. Written by travel experts and parents who understand the need to keep children entertained while enjoying family time together, DK Eyewitness Travel: Family Guide New York City offers child-friendly sleeping and eating options, detailed maps of main sightseeing areas, travel information, budget guidance, age-range suitability, and activities for New York City.